CAREFULLY READ AND FOLLOW THESE INSTRUCTIONS BEFORE OPERATING YOUR UDOR PUMP FAILURE TO FOLLOW THESE INSTRUCTIONS MAY DAMAGE PUMP AND VOID WARRANTY. HOW THE PUMP WORKS (The diaphragm is what separates the pump oil from the spray material.) Each piston DOWNSTROKE lowers the piston-attached diaphragm, drawing spray material into pump head. As piston passes below cylinder sleeve side openings, oil is pulled into lower diaphragm cavity. During each piston UPSTROKE the cushion of oil between the piston and the diaphragm hydraulically pushes and cushions the diaphragm as the piston tops out. This discharges the fluid in the pump head. The lower diaphragm cavity oil cushion also lubricates the diaphragm and piston ensuring minimal mechanical wear. REMEMBER low oil level causes excessive mechanical wear on diaphragms and internal components. The transparent oil sight guage makes oil checks easy. Keep filled to mark on sight gauge. Open Suction Valve and check tightness of suction lines, fittings and filter. The diaphragm pump will not suffer if run dry due to an empty tank. However, a "starved" suction due to a clogged strainer or a closed suction valve will cause premature failure of the pump diaphragms. NOTE: Only use filter screens that are between 10 & 20 mesh. Never use a fine filter screen with a diaphragm pump. The crankcase oil plays a dual role. It lubricates all moving parts and is hydraulically functional in the pumping capacity. Oil supports the diaphragm during each pressure stroke. It is important to maintain the recommended oil level, marked on the oil sight guage. UDOR diaphragm pumps are designed to operate at or below a specific speed. Over speeding will cause valves and diaphragms to prematurely fail and could cause other internal damage. 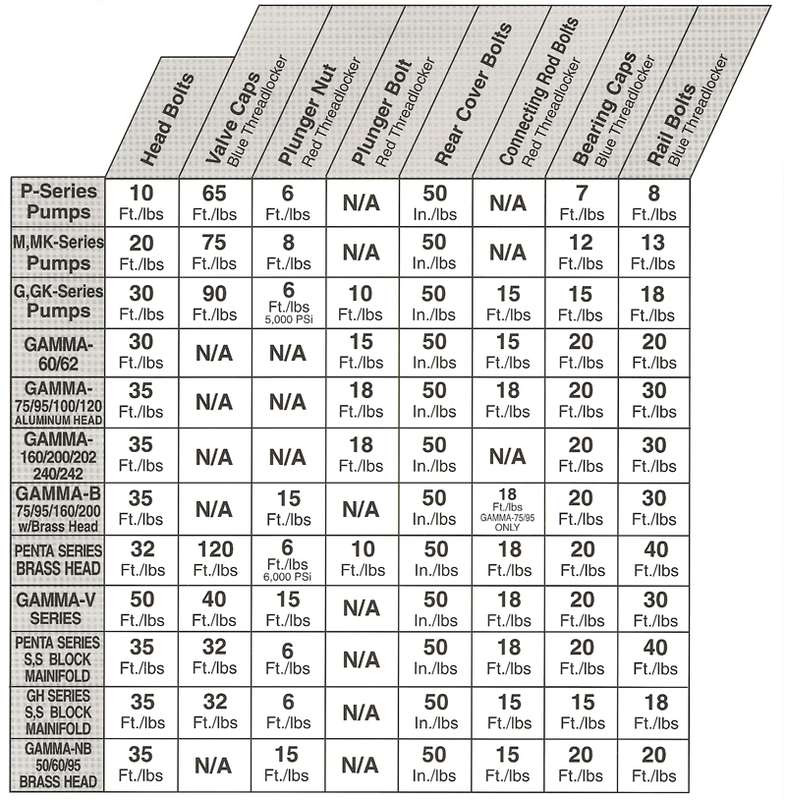 Refer to the performance chart of your specific pump for maximum operating speed. It is the nature of diaphragm pumps to have some pulsation. This is caused by sudden changes in piston direction. The pulsation dampener has one function in the pumping system, reduce pulsation by providing a cushion of air to bump against. 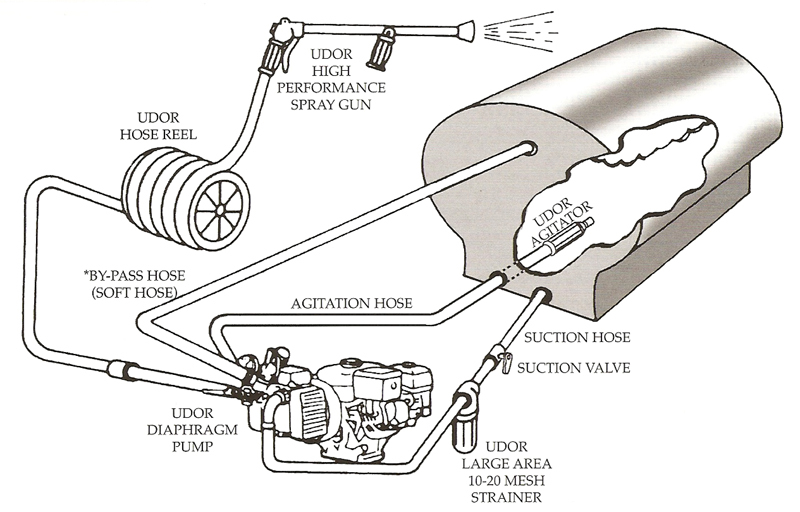 The UDOR pulsation dampener uses a rubber bladder to separate the air cushion from the solution being pumped. The basic rule is to fill the pulsation dampener to twenty percent (20%) of the system working pressure. If the maximum spraying pressure on the pump is set at 300 psi, the setting for the pulsation dampener should be 60 psi. Always shut down the pump before adding air to the pulsation dampener or checking its pressure. Air supply can be from a compressor or a manual type pump. The dome containing air is small. Take care to apply the pressure gauge evenly on the air valve to prevent air from leaking out of the pulsation dampener. It is not uncommon to lose 5-10 psi when checking pulsation dampener pressure. 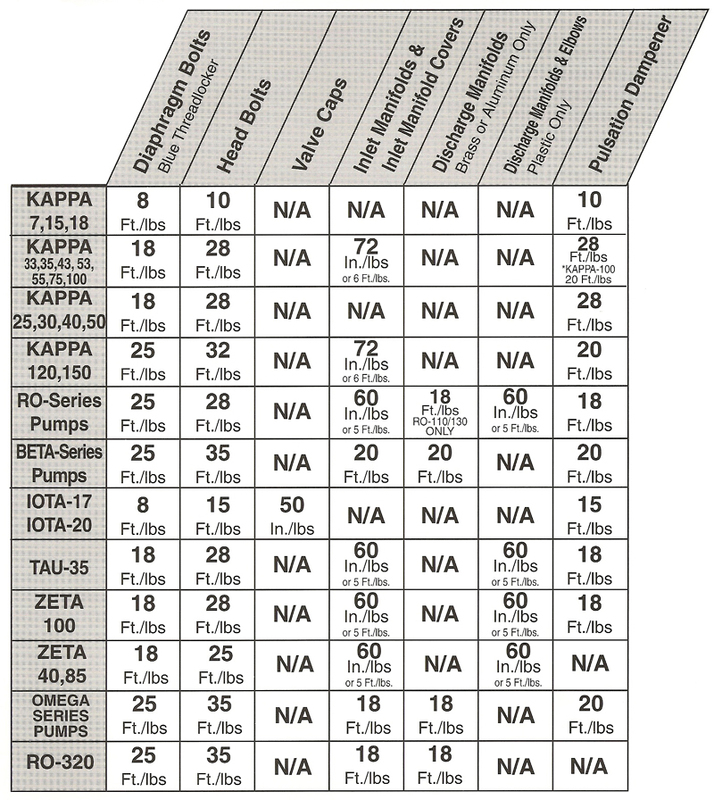 NOTE: 2-cylinder diaphragm pumps may require more air than 20% of operating pressure. 20 psi is the minimum pulsation dampener pressure. DO NOT RUN PUMP WITH LESS THAN 20 PSI IN THE PULSATION DAMPENER. BYPASS HOSE MUST BE OPEN AND UNRESTRICTED AT ALL TIMES. NEVER INSTALL AN AGITATOR OR BALL VALVE ON THE BYPASS HOSE. Protect pump from freezing. If freezing conditions exist, flush pump and hoses with a 50 / 50 mixture of anti-freeze and water. ODOR diaphragm and plunger pumps "pump volume", not pressure. The pressure is determined by adjusting the relief valve and selecting proper orifice size of spray nozzle or nozzles. * NOTE - Only use filter screens that are between 10&20 mesh. Never use a fine filter screen with a diaphram pump. TO PROTECT AGAINST SERIOUS INJURY, NEVER SPRAY FLAMMABLE LIQUIDS, OR FLUSH PUMP WITH FLAMMABLE LIQUIDS! THIS WILL VOID ANY AND ALL WARRANTIES. Establishing and following a maintenance schedule is a good investment. It will add greatly to the longevity of your pump and your sprayer. STEP NO. 2 "AFTER EVERY 500 HOURS OF USE OR AT SEASON'S END" (whichever comes first). Install a new set of diaphragms. Inspect check valves for spring fatigue and seat wear. Change oil using UDOR LUBE premium pump oil or a non-detergent 30 weight oil: hand rotate shaft while filling. This evacuates most unwanted air pockets. Run pump five minutes under "no-load" condi¬tions. This evacuates remaining air pockets from diaphragm cavity. Recheck oil level. STEP NO. 3 "WINTER STORAGE" Perform Step 1 (above), then, with tank empty and suction and discharge valves "open", run pump one minute to ensure complete drainage of pump heads and lines. Recirculate antifreeze and leave in system to complete winterizing procedure. NOTE: Allow antifreeze to replace any possible water in hoses and booms. If a handgun is in the system, run antifreeze through the hose and handgun into tank lid open¬ing to clear and/or dilute water. (Depending on the length of hose, more than one gallon of antifreeze may be required to protect the system from freezing). Drain pump crankcase by removing the oil drain plug located at the bottom of the pump, also remove the oil fill cap or plug. NOTE: On older pump models that DO NOT have the oil drain plug, oil needs to be drained after the head, diaphragm and piston sleeve have been removed. NOTE: When re-installing piston sleeves, the oil holes must always align parallel with the pump crankshaft. If your pump has external manifolds, these must be removed prior to head removal. Remove the head bolts, and then remove the pump heads which may require some "light" prying. Turn crankshaft to bring piston up to the top of its stroke, remove the diaphragm bolt and washer, then remove the diaphragm. To properly clean the crankcase you need to remove the piston sleeves and wash the crankcase with parts washing solution or equivalent. Before re-installing the piston sleeves, apply a light coating of oil to both the pistons and sleeves. NOTE: Make sure the oil holes in the piston sleeve align parallel with the pump crankshaft. Install the diaphragm bolt and washer into the new diaphragm. Install this assembly to the piston, flat side of the diaphragm down. Use blue thread locker or equivalent on the diaphragm bolt. Then torque to the recommended specs. Now rotate crankshaft to bring the piston and diaphragm to the bottom of its stroke. Then seat the outside edge of the diaphragm into the pump body. When reinstalling the pump heads it is very "IMPORTANT" to make sure that the check valves are installed correctly. For each cylinder there are two valves, one valve lets fluid into the head, the other valve lets fluid out of the head. PAY VERY CLOSE ATTENTION TO THIS! Then torque pump heads to rated torque specs. Bleed off the air in the chamber, then remove the cover bolts, cover and diaphragm, install the new diaphragm dome down. Reinstall cover and torque to recommended specs. Recharge dampner with air to 20% of the pumps operating pressure. Check the oil drain plug, making sure that it is installed in the crankcase. Fill the pump with UDOR LURE premium pump oil or SAE 30 weight non-detergent oil to the recommended mark on the oil sight glass/gauge; about halfway on the oil sight glass/gauge. Rotate the crankshaft while filling to eliminate air pockets. Run pump for five minutes under NO Load conditions. This will evacuate any remaining air pockets in the crankcase. Turn pump off and re-check oil level. Refill as necessary to proper oil level. "IMPORTANT" During initial start up, monitor the oil color. If it turns milky white, the diaphragms were not seated or installed correctly. To service the valves, remove valve caps. Remove the valve assembly from the valve cavity. Remove o-ring from valve cavity. Only one valve kit is necessary to replace all the valves in the pump. The kit includes new o-rings and valve assemblies. Insert valve assembly into valve cavity. Install valve cap and torque to specifications. NOTE: Use blue thread locker or equivalent on all valve caps. Remove the bolts from the pump head. Separate the head from the crankcase. NOTE: It may be necessary to tap head lightly with a plastic or rubber mallet to loosen. CAUTION: Do not damage plungers when removing the head. The packing assemblies typically come off with the head. At this point, inspect ceramic plungers. Plunger surfaces should be smooth and free from scoring and cracks. IF NOT, replace plunger. Remove plunger nut or bolt, then remove plunger from piston rod. If slinger washer comes off with the plunger, be certain this is reinstalled or replaced before a new plunger is installed. Separate plunger bolt from plunger. Install new o-ring, teflon back-up ring and washer on plunger bolt or stem. NOTE: A film of grease on the outside of the o-rings ensures a better installation. Carefully insert plunger bolt into plunger. NOTE: Use red thread locker or equivalent on all plunger nuts or bolts. Slide new plunger over the piston guide and torque to specifications. Insert proper seal stack extractor tool or reversible pliers through sealretainer. Extract retainers, packings and spreader rings. Place proper insertion sleeve into cylinder and install plastic spreader ring into bottom of the cylinder. Insert high pressure seal into insertion sleeve and tap firmly into place. Remove insertion sleeve. Install long life ring on top of the high pressure seal and insert middle brass ring. Install the low pressure seal into upper brass ring, lightly grease the outer o-ring and insert into cylinder. Coat each plunger and seal stack with grease and carefully reinstall the pump head. NOTE: It may be necessary to tap pump head lightly with a plastic or rubber mallet. Install head bolts and torque to specifications. EFFECTIVE IMMEDIATELY, ANY PUMP THAT IS TO BE RETURNED TO UDOR U.S.A. FOR REPAIR OR WARRANTY EVALUATION, MUST BE FLUSHED OF ANY AND ALL CHEMICALS! THIS ALSO PERTAINS TO CRANKCASES THAT HAVE CONTAMINATED OIL. THIS POLICY IS BEING PUT INTO PLACE TO PROTECT OUR PERSONNEL FROM POSSIBLE EXPOSURE TO HAZARDOUS OR UNKNOWN SUBSTANCES.